This delicious and easy to make chutney with sour mangoes is a perfect accompaniment to curd rice or can also be in a variety of dishes. 1. Peel and chop the mangoes into small pieces. 2. Discard the inner seed. 3. Heat little oil in a pan over medium flame. 4. Fry the mustard seeds, urad dal, dry red chillies and green chillies for 30 to 45 seconds. 5. Add the mangoes, grated coconut and enough salt. 7. Remove from flame and cool. 8. Grind together with little water to a coarse chutney consistency. 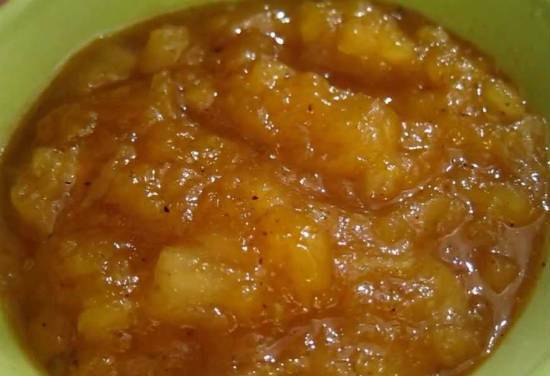 Feel free to comment or share your thoughts on this Mango Chutney Recipe from Awesome Cuisine.